I call this a mini craft because it was so simple. 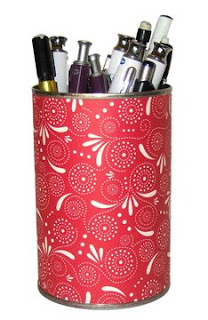 Turn a tin can into a pencil tin just by wrapping it in pretty paper. You could make a coordinated set of these for pens, pencils, markers, paint brushes, etc. Also you could use a small paint can instead of a food can. Ooo, and if you were real crafty, you could put a ribbon around it and a tag on the front that says "pencils", or "markers." In fact I might just have to do that, and re-post this. how to you stick the paper onto the tin? modge podge? double stick tape?